In response to that, the Diocese of Imus launched its program called “Vocfest”, a vocation jamboree intended for the youth of the Diocese with the Theme: “Ating Pagsaluhan, Buhay na may Kabanalan” (We Share the Life of Holiness), at Rogationist College, Lalaan II, Silang Cavite last November 16-17, Saturday and Sunday. This year’s celebration was participated on by approximately 3 – 4 thousand young men and women who, out of their curiosity, ventured the experience with the religious communities of different congregations. 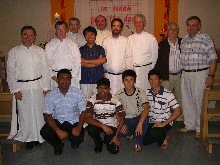 The Father Jordan Youth (FJY), Talon and Maymangga members were one of those who attended, headed by their facilitators and brothers named Cristopher Osares, Gilbert Batomalaque, Michael de la Cerna, Hoang Vinh Xuan (Paul), Giovanne Haresco, Nguyen Van Luat (Joseph), and Michael Angelo Calucin. The “Vocfest” featured many activities. For instance, the religious congregations have their own booth to provide at least an initial thought of their communities. 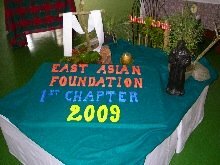 Next, they have the congregational tour where few or a group of participants visited the formation houses for an in depth experience. 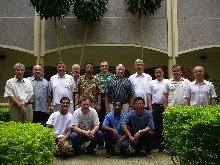 The Salvatorian Community accommodated 50 participants where Bro. Christopher Osares explained the society’s history, founders, and charism. Bro. Michael de la Cerna talked about “The Vocation of the Human Person”. The “Vocfest” is not a simple celebration. It is a prayerful one where the participants experienced the vespers, adoration, and the Holy Eucharist as the conclusion. The participants were allowed to share their thoughts during the sharing time. 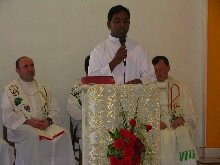 A speaker provided more input and color to the celebration as they elaborated the mission of the youth of today that is to promote faith and evangelize through their way of life. As a sign of authentic Caviteño celebration, Karakol was danced at dawn not only to awaken the sleepy people but to ask the Lord and our patrons to send more laborers to the Holy Vineyard. The Celebration was concluded by the Holy Eucharist presided by no other than the Pastor of the Diocese, Bishop Reynaldo G. Evangelista D.D. In a world where people move fast and life was characterized by anything instant, we are called to be sign posts for all, to remind them of the love of God and to promote this love. This is the mission, entrusted by the Lord from the Apostles down to our generation. And as we go further, more challenges are there for us. We, in one way or another are expected to live life, according to the Gospel and to manifest to the world the Light of Christ (Lumen Christi) which is present in every situation that we encounter.